CAN MR. MODI TRANSFORM INDIA? Mr. Modi came to power with the promise of being a transformational leader. But most of his recent “big bang” ideas have been anything but transformational. Transformational ideas should not be confused with governance. Building 10 Km of new roads a day, constructing toilets, providing infrastructure for power and clean water–these are all issues of governance. Citizens expect good roads, continuous power, and drinking water in return for paying taxes. Transformation requires replacing India’s broken institutions with a new set of institutions that transcend people and party. 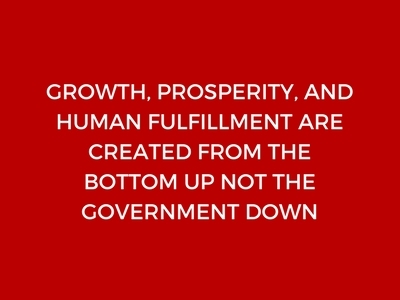 This would require a new government structure that is based on the principles of limited government and devolution of power away from the state and back to the people; economic and financial institutions that promote economic freedom, private enterprise, deregulation, and free markets; new security institutions that include a modern police force and strong judiciary and equal justice for all; and strong social institutions based on individual freedom and rights, equal opportunities and individual responsibility. These transformational ideas can only be driven by leaders with a strong foundation of beliefs built through years of study and reflection. As Chief Minister of Gujarat, Mr. Modi’s primary responsibility was executing projects, and it is unlikely that he was required to reflect deeply on issues like institutional structures, free markets, state intervention, size of government, monetary and macroeconomic policy. He also does not have an appreciable record of significant economic, philosophical, or political writings. Mr. Modi’s biggest transformational idea was the slogan “ minimum government, maximum governance” which was a prominent part of his 2014 election campaign. It is now clear that the notion of minimum governance was just another election gimmick and that he does not understand that India’s major problems are the result of the size and reach of the government. He had a chance to reduce the number of ministries with his recent cabinet reshuffle, but he whiffed. So after three and a half years of the Modi administration, the government is now bigger, and front and center in every aspect of economic and social activity. Let me illustrate this with three of his most recent ‘transformational’ ideas. Even Mr. Modi’s most ardent supporter will now acknowledge that his biggest ‘transformational’ idea, demonetization, was an abject failure. It was a reckless display of the power of ‘big government,’ and while it made for good theatrics, it was bad economics. Most economists, including several Nobel prize winners, have criticized it as an example of the ‘ heavy hand of big government.’ Since Mr. Modi has never disclosed the names of the economists who assisted him in shaping the demonetization decision one has to conclude that he did not seek expert advice, or if he did, he chose to ignore it. No sane economist would have advised him to remove 86% of the nation’s currency especially given there were other, more effective and less damaging, alternatives to addressing his stated objectives of black money, corruption, and counterfeiting. Rarely has any government introduced something as disruptive as this with such little study, thought, or preparation. This is the hallmark of an impulsive and not a transformational leader. Mr. Modi’s next big idea was the GST–it was first floated by Mr. Atal Behari Vajpayee and given shape by Mr. Manmohan Singh. The GST is an effective tax instrument, and about 140 countries use some variant of it. A big advantage of GST is the improved compliance that comes from chaining taxable transactions that make tax evasion easy to detect–but only if the process is easy to administer. The Modi government has weakened that salient attraction of GST by a needlessly complicated structure which taxes products at different tax rates. Numerous studies and the experience of over two dozen countries have shown that GST works best when all goods and services are taxed at the same rate. The Modi GST, it appears, is aimed at increasing the size, reach, and power of the government. Taxing products at different rates gives extraordinary arbitration powers to the Revenue Service. The same corrupt tax officials that have for years terrorized businesses with arbitrary tax demands are now in charge of deciding whether a rubber ball is a rubber product taxed at 5% or a sporting good taxed at 18%. It is a frightening thought that now through the GST the government can control the final prices of all goods and services sold in India. The consumption of goods, and hence the allocation of economic resources will shift towards industries with lower GST rates. Politics, special interests and vote bank considerations instead of economics will now decide which products get reduced GST rates. Instead of the free market dictating consumption, production, and resource allocation decisions, the government and its bureaucracy will now control the allocation of resources. This is exactly what happened under the License Raj and Quota system in socialist India. The government picked winners and losers among industries. Modi’s GST does the same and this will hurt economic growth by reducing economic freedom and increasing the power of the government. Mr. Modi’s third ‘ transformational ‘ idea was to waive Rs. 32,000 crores in farmers loans as part of the election rhetoric in the State of Uttar Pradesh. There is a cardinal rule in economics that “ THERE IS NO FREE LUNCH.” Someone has to pay for these loan waivers. An impulsive and politically-motivated decision now shifts the financial burden from the farmers who benefited from the loans to the taxpayers who derived no benefit from them. As of this writing, about Rs. 1 lakh crores of farm loans have already been waived in five states, and farmers in several other states are lining up demanding similar waivers. The total bill for all this is expected to be about Rs. 2.5 lakh crores. To announce loan waivers of such magnitude at a time when the nation’s banking system is under severe duress is even more reckless than demonetization. Farmers have already racked up almost Rs. 6 lakh crores of unpaid balances in the KCC ( Kisan Credit Card) scheme. Additional loan waivers of Rs. 2.5 lakh crores is gravely irresponsible. No responsible economist would have recommended this and again goes to show that Mr. Modi either does not seek expert economic advice or chooses to ignore it. History shows that a leader that starts favoring one group over another can cause great social harm. Transformational leaders understand the cardinal rule of good policymaking –benefit to many with harm to a few. Mr.Modi has done just the opposite. It appears that people are beginning to lose trust in Mr. Modi because of his recent policy blunders. And if as expected the economy slows down over the next year this trust will get eroded further especially since so much was promised before the election. And trust is a key ingredient for effective leadership. The next two years will be a challenging time for India. In an attempt to regain that trust and win reelection I expect Mr. Modi to start getting more reckless especially on matters related to the reach of government and personal and economic freedom. This is not the transformation India needs.